One of the biggest problems peer-to-peer event planners face is $0 fundraisers. They register to participate in your fundraiser, they just never actually get started. How can you encourage your peer-to-peer participants to, well, participate? If you read my last article, you know I’m participating in my very first peer-to-peer fundraiser. Here are some methods the organization, Lakeland Volunteers in Medicine (LVIM) used to get us started. The team at LVIM recruited every person who’s participating in the Lakeland Derby. Each of us was asked individually if we’d take part in the fundraiser! The people LVIM’s staff recruited to participate are called “Leaders of Polk,” and each participant is strategically chosen because of their involvement in the community. After all, it’s easier to raise money for a great cause when you have a great network of potential donors! Because each participant is asked individually to take part, LVIM can be sure we’re all committed to being fully involved. And, since so many of us know each other, there’s already a sense of friendly competition between each team! You might not be able to individually recruit everyone who participates in your event. Because the Lakeland Derby only involves 10 two-person teams, that was feasible for the team at LVIM. If you’re running a larger event, try to recruit a dedicated group of participants who are already passionate about your cause. You can show them the ropes, establish expectations, and empower them to recruit and guide other participants! They’ll help build momentum among other participants that will drive involvement among the other participants. Try looking to your volunteers, staff, and past event participants to find your group of leaders. Those people are already familiar with your mission and the event itself! Technically, they threw two kick-off parties! The first one was an informal cocktail party at a board member’s home. We shared drinks, got to know each other, and learned more about the event. We also heard from LVIM staff and board members, which was inspiring! Perhaps most importantly, this event is where we got important information, received our passes to the event, and signed all the waivers the staff needed before the event. The second event was a more formal cocktail party. The Lakeland Derby participants drew our jockey numbers for the race and got to test-drive one of the swan boats we’d be racing the day of the event. We also got to meet people who were involved in other Lakeland Derby events. This was also a great opportunity for us to meet the event sponsors, take pictures that we shared on our own social channels to build anticipation for the start of fundraising, and to get to know several board members. LVIM staff then gave us a run-down of how fundraising would work, the rules, and some ideas for getting started. Signing waivers and other paperwork is boring. Hunting down event details can be tedious. Recognizing sponsors can often feel awkward or forced. And nobody is ever thrilled to get an email full of fundraising rules and instructions. The staff I’m working with incorporated uninteresting housekeeping items into two parties, which turned chores or obligations into social events. Make it fun for participants to start fundraising! If you don’t have the time or resources to throw parties this way, try other methods of reaching out to your participants. 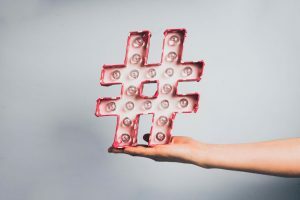 Try a live-stream video on Facebook or Instagram to build anticipation among participants and to walk them through important steps or processes. Or, try setting up a welcome email series to new participants that guides them through signing paperwork and the rules for your event. Get creative! Lakeland Derby participants have exactly 1 month to raise money for their cause. The fundraising period runs from March 25 to April 25, and nobody is allowed to take even a dollar before or after those dates! To really get fundraising started with a bang, the LVIM team organized a fundraising event on March 24. Any team that wanted to participate could sign up to work the grill at BD’s Mongolian Grill, a local Mongolian grill where patrons build their own stir-fries. 20% of supporters’ bills were credited to LVIM, and the proceeds were split among the participating teams. At the end of the night, all our fundraising pages were activated, so we could share pictures from the night to our social channels and ask for support the next day. The fundraising event was so fun! Everyone invited their friends, families, and co-workers to eat dinner at BD’s that night, and everyone had a blast taking turns behind the grill. 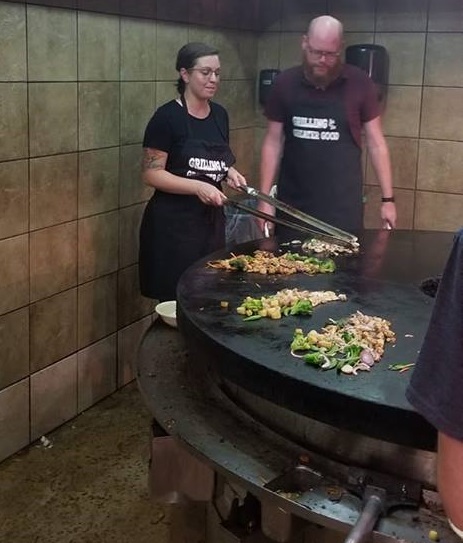 Attendees had plenty of chuckles at our expense (working a grill is hard, working a Mongolian grill is harder, working a Mongolian grill with two swords instead of spatulas is even harder), and everyone had a good time. It was a fun way to build visibility for the upcoming fundraising period! It was NOT fun to try to keep shrimp from rolling all over the very-hot grill, but that’s a story for another day. Lots of concentration here. Not pictured: rogue shrimps. How can you build visibility and excitement around the beginning of your fundraising period? You can try partnering with a local business to raise money, like LVIM did. Or you could host an event that formally kicks it off — maybe you could staff the event with your participants! However you do it, planning something that marks the official start of fundraising will get participants excited about being involved. It’s much harder to put off fundraising when there’s an official “GO!” signal! Get a peek into real-life tactics LVIM has been using to keep us engaged with fundraising. We’re all busy people with jobs and families, but they’re doing a great job staying in touch without seeming annoying or overbearing.